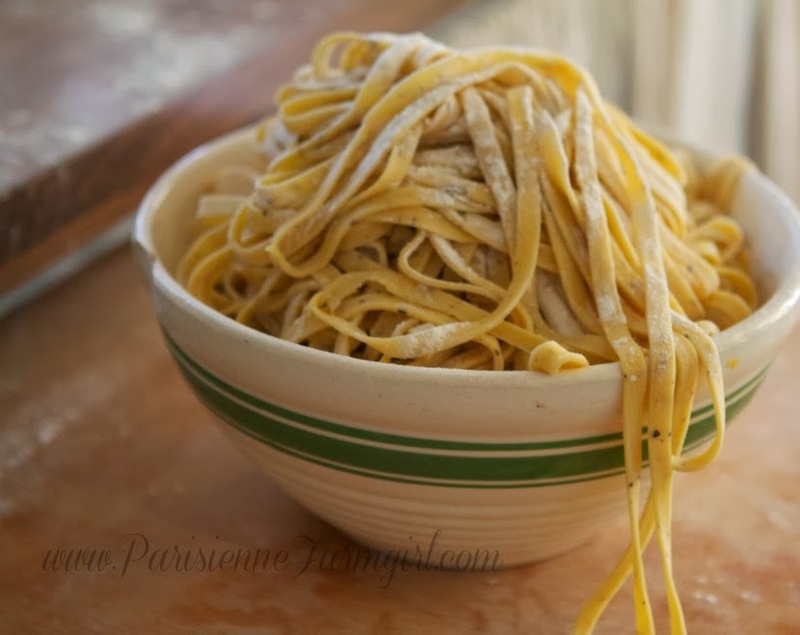 Sometimes I wonder if you ever lived until you’ve been to Paris… lived on a farm… eaten homemade pasta. I highly recommend all of those things of course but making homemade pasta is the easiest of the three. I bought attachments for my miracle mixer last year and the girls and I are totally addicted to making noodles. The rest of the family is completely spoiled and now they complain if I make pasta from a box. “measurer” so I leave some things to the eye. Trust yourself. It’s just pasta – it’s not a chocolate soufflé. 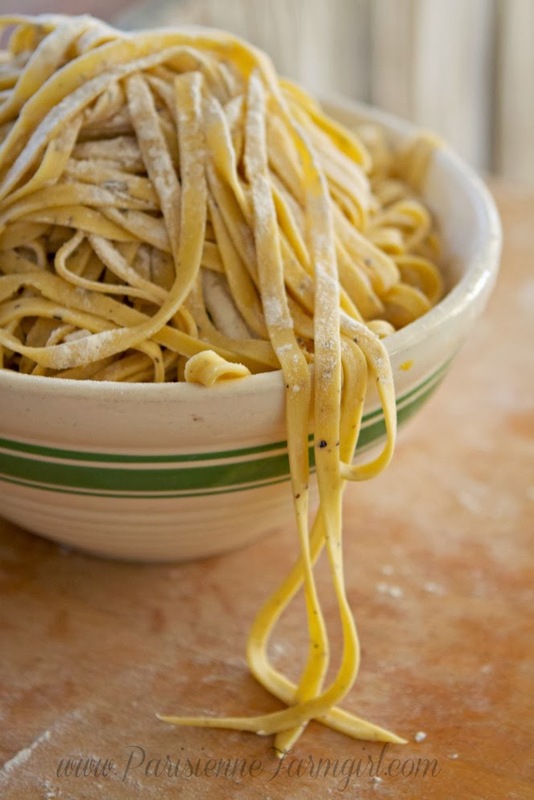 We make spagetti, linguini, and even homemade ravioli (pumpkin with sage and clarified butter… oh my heaven!!!). My favorite meal so far is my Gramma’s chicken and noodles made “my way” and I’ve include that recipe down at the end of this post. 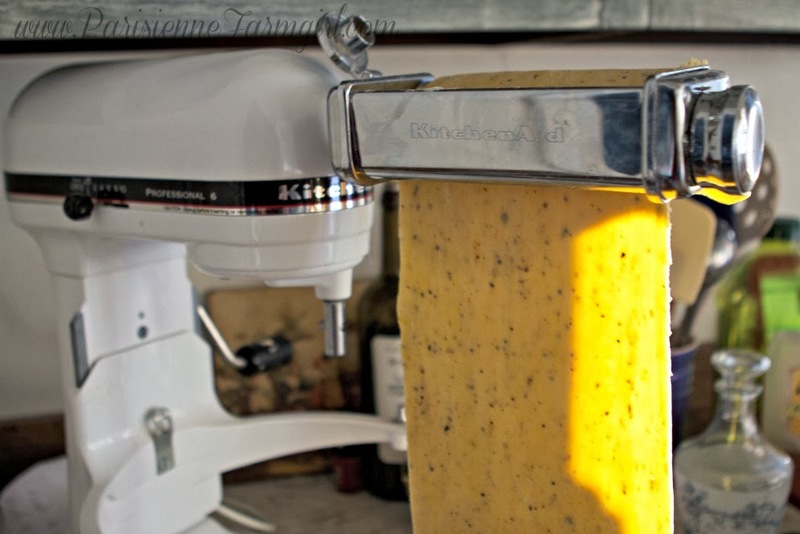 You will need a mixer with pasta attachments (the lasagna noodle and linguini attachments) – you probably can use my recipe making it by hand and cranking the noodles out with a manual pasta maker or even with rolling pin and sharp knife but I have never done that. Mix your eggs in a small bowl and put your flour in your mixer’s bowl. Add your eggs, salt and pepper to the flour and mix just slightly. Use your basic mixing attachment – the one that looks like a peace sign. Add olive oil and then the water; adding the water tablespoon by tablespoon. Mix it a bit… I count to thirty. You don’t want the dough to be watery but you don’t want it dry and dusty either. You can see in the photo below that it’s not a perfect dough, it will be slightly crumbly at first – I personally don’t care to work with it if it’s terribly dry. (As you make your pasta more frequently you will get the feel for what you like. You may want to add more olive oil, less water or visa versa.) Then switch to your dough hook and mix for a couple minutes. Two or so. Don’t over mix. You will then remove the dough and form it into a ball. Get your muscles ready and kneed it on your floured countertop, as the gluten does it’s thing your dough will get smoother and easier to handle. Keep working it! Place it in a zip lock bag and let it sit for 20-30 minutes. No longer. After the allowed time, divide it into four pieces. Take one chunk and leave the others in the (slightly opened) zip lock so they don’t begin to dry out. Form the first piece into a sort of rectangle about 5×3 inches. And now the fun part. Install your lasagna attachment and set it to setting number 1. Turn on your mixer and begin to feed your dough through. If your piece is about a half inch thick it should grab, if it won’t grab you may want to flatten one of the three inch sides of your rectangle so it does. Just give it a little pinch along the edge so it will catch in the rollers. Run the piece through one time and then fold it in on itself as seen in the photo below. Run it through one or two more times. Each time your dough is going to become more and more compliant. Dust very lightly with flour in between each step. Next switch the setting on the attachment to level two and run your dough through once or twice. Continue in this fashion until you have run it through twice on level four. This is my preferred thickness. Stopping at level three makes a fine noodles too. Just look at the thickness of your dough and determine if you want to keep going. I like a hearty noodle but you may want to continue to level five or even six. (You can have the speed on your mixer set on two so that it doesn’t take foooooorever.) At this point you will have a flat piece of pasta that is 24-36 inches in length. 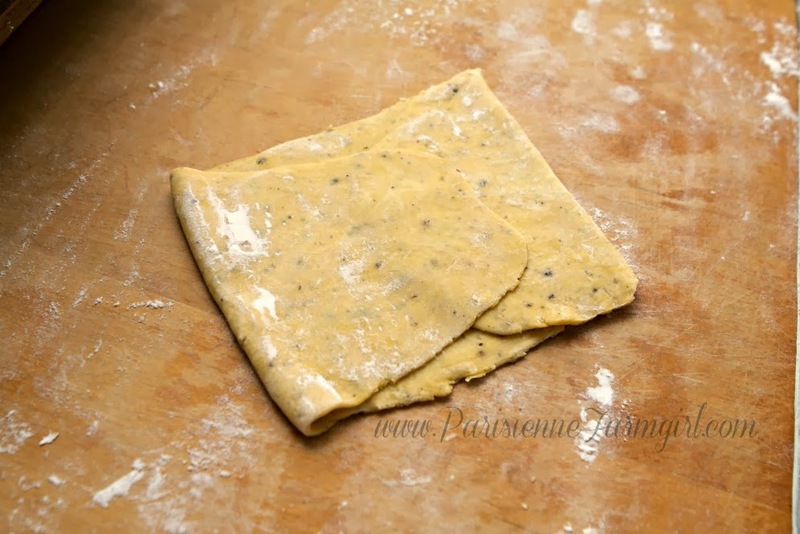 Lay your dough out on a flour dusted surface and repeat this process with your next three pieces. Now you will want to attach your desired noodle attachment. To make the noodles you see here I used the linguini attachment. Make sure your big, flat noodle is lightly dusted and run that piece through, holding the right side up. If you let it hang the pasta will stop feeding thru because of the weight of the dough. I hold my right hand up, holding the pasta that is being fed through and I hold my left forearm under the out-coming noodles after the first twelve inches or so. I then transfer them to a plastic hanger if I am going to dry them or to a bowl as seen below if they will be made right into our dinner. Note: I make two batches to serve 6 people with some leftovers. This takes me thirty minutes start to finish. NOT counting the actual cooking of the noodle. You can make little “bird’s nests” and freeze your noodles in a zip lock freezer bag or after they have dried you can use old cardboard oatmeal containers for storage. Make sure your noodles have properly dried before dry storage so that no mold develops. I love to use my McCann’s steal cut oats containers after pealing off the label. It has a cool black lid and I love to use them for giving pasta gifts. If you’d like to make Gramma’s fabulous Chicken and Noodles, toss a farm raised chicken in a big kettle of water in the morning. Adding celery, garlic, onion, salt and herbs de Provence. By dinner time you will have killer stock. While your noodles are cooking fish out the chicken and remove all the meat, nicely shredding it and setting it aside in a bowl. In a small sauce pan mix a half-stick of butter, homemade or KerryGold is the best and a 1/2 cup or so of chicken stock. (Freeze the rest of your stock for a million different uses!) Serve noodles cooked al dente mixed with the shredded chicken with your butter/stock sauce poured over the top. Hold on to your socks. It’s amazing. You CAN make pasta without the fancy equipment. There are plenty of tutorials on line where you mix by hand and roll out with a rolling pin and slice with a knife – so don’t be discouraged. The only reason I have my mixer is because of a very, very kind blog reader some years ago… I’ve been so blessed by my readers. You will truly become addicted to homemade noodles. It’s fun to take an afternoon and just make a TON of them for use over the coming weeks. What a treat for your family, guests and yourself! I’d be happy to answer any troubleshooting questions. It’s on my to-do list to try this with GF flour. I have lots of GF friends and family – if you do, please share your results! This sounds delicious. I am so excited that you have new posts on the blog and each one is inspiring. Hi Angela, I make noodles with GF flour using the Namaste brand. I didn’t make any adjustments from my old wheat flour. I don’t measure it either, I just know what texture I’m after, They were ok, edible, beats not having noodles at all I guess. Nothing taste as good to me as wheat flour and trust me I have tried them all and every mixture out there. I am Celiac and have to eat GF. It has been a rough year for me cooking wise, learning to redo everything I know. This has been a hard journey for a girl who owns over 200 cookbooks and everyone one of them has splattered pages with dog ears. I love to cook, this has been a real hard knock in the pants for us but I am so thankful I am not sick anymore, last endoscopy shows my stomach lining is starting to heal and almost all my other symptoms have went away. When I first started reading your post, I was so curious to see which flour you would be using. Pasta is a weakness of mine. I just love Italian food and the sauces…I am truly indulging when I prepare pasta with homemade basil pesto and cream. Throw in some sautéed asparagus, grilled chicken, and parmesan cheese and I’m in heaven. 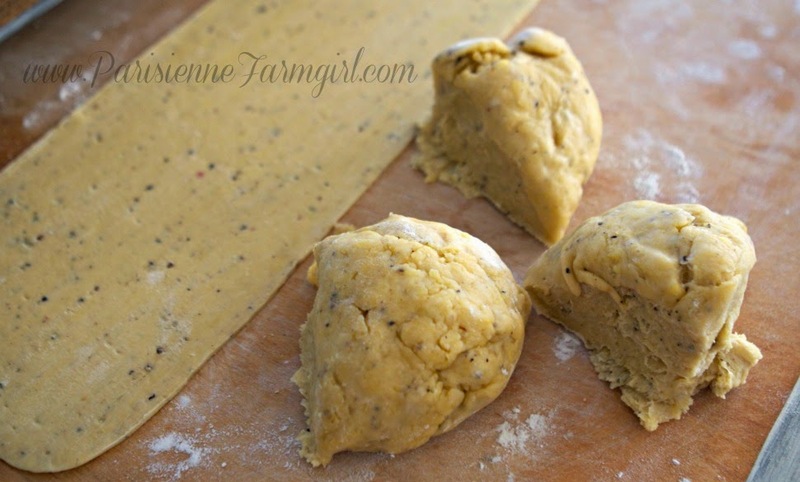 I know we would love homemade pasta. I may have to try it before the little babe arrives. 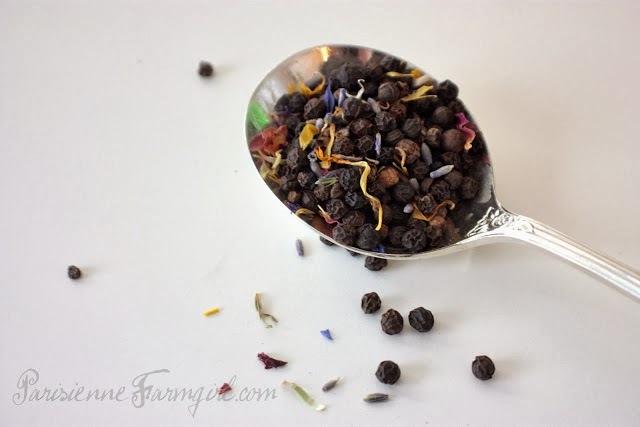 Your flower pepper pasta sounds delicious as well as the chicken–when is herbes de Provence not a homerun?! Ahhhhhh…I’m still enjoying your posts! I won’t be making any pasta myself, but I’ve surely had a pleasant read going through this post! Kudos to you and what you do! Love on those sweet babies and enjoy the life you and your husband have crafted; keep blogging and I’ll keep reading…and will comment again in another year or so! LOL! Just came across your blog via Fiona and Twig. Can’t wait to try and make your flower pepper! I’m GF and love homemade pasta. I use the ‘Bob’s Redmill GF All-purpose flour’ and always use a little xantham gum. I find it helps bind the dough together and makes it easier to manipulate into whatever shape I’m set at accomplishing 🙂 Bon Appetit! I’m so proud of your kitchen zeal!!! This looks fantastic! Now I’m going to have to buy the attachments for my mixer! I originally found your blog many moons ago, I keep thinking I was reading your mom’s blog? Maybe I dreamt that, but for the life of me I can’t remember who it was! Oh my! this pasta looks soooooo delicious! Well done! i’ve just dicovered your beautiful blog and I’m already in love with it! Noodles look delicious and I’m sure they taste awesome. Looking forward to seeing your noodles in the stores to purchase. Mail order?? ?